Almonds, along with other nuts, are a wonderful source of vitamins and minerals. There are nuts which are considered to be toxic for dogs; these are an absolute and clear no-no. That’s simple. Almonds for dogs, however, don’t fall into that category. These nuts are sort of in-between. They aren’t as good as say cashews or hazelnuts or peanuts. On the other hand, they also aren’t as harmful as walnuts, pecan or macadamia. Our furry friends want to try everything that goes into our mouth. It doesn’t matter to them if the thing we eat is kale or bacon. Well, maybe it does a bit. The point is that it would be easy to just surrender to their begging and give them what they want. But that is not responsible parenting, isn’t it? Are Almonds Good for Dogs? Generally speaking, almonds are good for dogs. 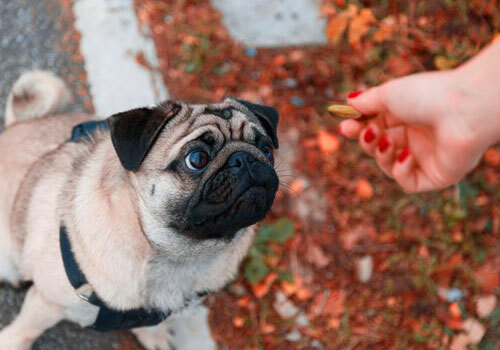 Dogs eating almonds opens up the door for them to a rich source of Vitamin E, magnesium, copper, high-quality protein, unsaturated fatty acids, antioxidants and more. They are real health bombs. But, together with all that, they might present a real danger to our pets. Almonds, to differ from some other nuts, aren’t toxic for dogs. 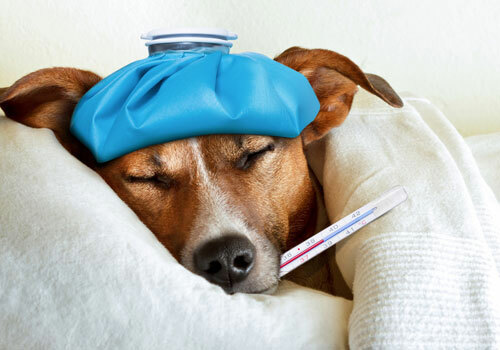 If happened and your pooch has chewed on a few and seems absolutely fine, there is nothing to worry about. However, it is not recommended that you actively feed your dog almonds. Good news is that there are alternatives. 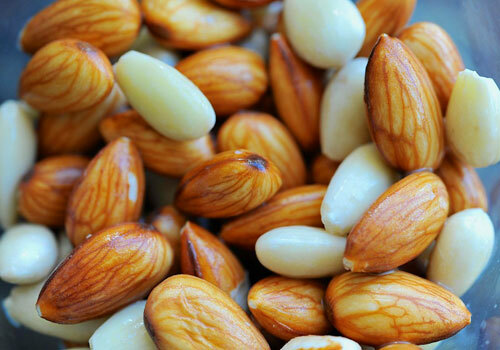 These are made of almonds, so they get to keep all of the benefits, plus skip the dangers. Perfect. Almonds and dogs can combine through almond milk or butter. These are sure to not cause obstruction and digested easily. Almond butter, unlike its friend peanut butter, is much less fatty. The thing to remember, though, when purchasing almond butter is stir clear from brands that use sweeteners (Xylitol is radically toxic for canines). Vitamin E, which almond butter is rich with, will add to the health of your dog’s coat and skin. Magnesium, iron and the rest of vitamins and minerals will take care of the rest. Even though almond butter is less fat than peanut butter, it is still fat. Too much fat can cause problems, so you don’t want to over give it to your dog. Stick to small portions and he’ll be just fine. If you are opting for almond milk, things are pretty similar as with butter. It is a good alternative to almonds and bears no negative effects on dogs. With that, don’t rush in with it. 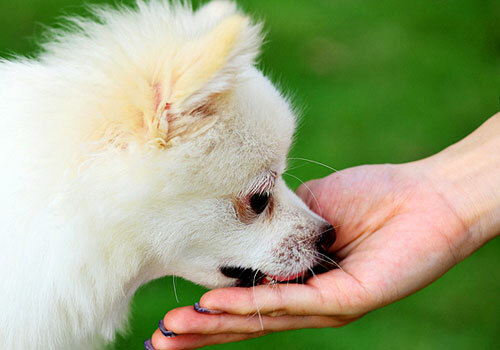 Give your pooch a small amount to see whether he likes it. It will also help you to establish whether he’s allergic to it or not. Too much of almond milk might upset his gastrointestinal system. Also, as was said before, make sure to buy one without sweeteners or other harmful ingredients. Simple, unflavored almond milk should do just fine. Why Are Almonds Bad for Dogs to Eat? 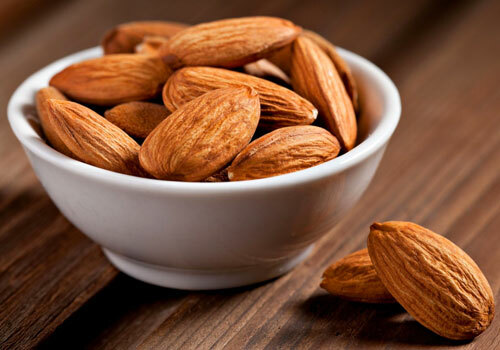 Most of the almonds sold in shops are flavored and either sugared or salted. And while it isn’t toxic for your pup, it still isn’t good. 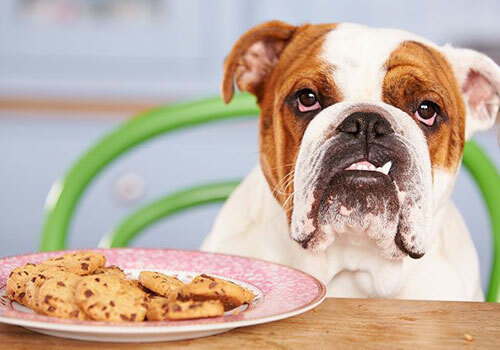 Your dog might go crazy for these treats, but they are harmful to him. Raw almonds for dogs present a choking hazard. They might obstruct his airwaves as well as cause gastrointestinal problems. 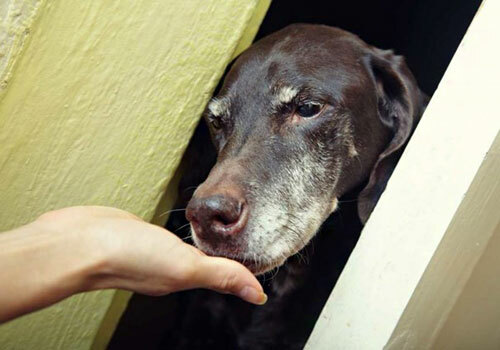 Obstruction of the esophagus or the stomach windpipe can be fatal for your pup. Dogs can’t digest almonds properly. If your dog has eaten a fair amount of almonds, watch out for diarrhea, upset stomach, and vomiting. All these are only typical short-term reactions of an animal encountering food their stomach doesn’t agree with. It is kind of similar in humans. Since almonds are rich in fat, long-term effects might include weight gain. But the big danger isn’t even that. It is the illness which they might develop. If happened and your dog consumed large amounts of almonds over a lengthy period of time, it might lead to pancreatitis. Pancreas is a small gland responsible for sugar levels in the blood, and you surely don’t want to mess with that. If your dogs eating almonds, give him only a tiny amount; perhaps even crush it into smaller pieces. You can mix it in his food; it will add a nice crunchiness and plenty of health to his diet. If you have salted almonds lying around the house, pay attention to them. Dogs love the smell of salty almonds and will grab a few on any occasion they get. The danger in that is the possible water retention that is caused by salt. Sodium affects the electrolyte balance in the body. Electrolytes are responsible for a normal function of the brain and the heart, fluid and oxygen balance and much more. You simply don’t want to mess with that. It is relevant to any dog and especially if he has already some health problems. It is wise to keep almonds high up in the cupboard, where your pooch certainly cannot reach. You could try and avoid giving him almonds altogether, substituting it with almond butter or milk. But if you do want him to enjoy real almonds, you’ll do well buying only plain ones. Now, let’s see in what quantity can dogs eat almonds and how to prepare them for our beloved pup. Almonds can be crushed to reduce choking and obstruction hazards. If you decide to opt for almond butter for dogs instead, let your creativity lead you on that one. You can smear it on or inside a toy and let your pooch lick it out. Or you can combine it with other healthy snacks, like pumpkin or carrot, by baking it all together. 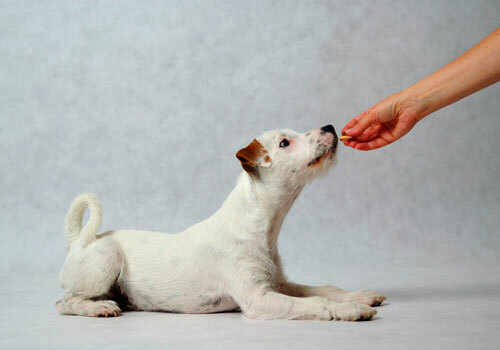 When dogs eat almonds, they rarely will care in what form it comes to them. This is your chance for almonds and dogs mix-and-match. There is always the simplest way of them all. Letting him have it directly from the spoon version has never gone wrong. When introducing almond butter for dogs, go-slow tactics will work best. Even though this food doesn’t come close to peanut butter in its fat consistency, it is still considered to be heavy on the organism. Some very creative people came up with indulging their four-legged friends with almond butter biscuits. It is supposedly very easy to make. Only four elements come together to make the perfect snack for your furry friend in no time. You can check out the recipe here. Since regular cows’ milk is known to be not good for dogs, almond milk is a great alternative. Important to emphasize, that it has to be plain, without sugar, chocolate or raisins. Sweeteners are enemies when it comes to dogs (they aren’t particularly recommended for humans either), so check the label for any, especially Xylitol. Large amounts of almond milk might irritate the stomach, causing all kinds of unpleasantness neither of you wants to deal with. So start little. One or two glasses should work fine. My Dog Ate Almonds! What Should I Do? The amount of how much is too much varies from dog to dog, depending on their size. If your pooch has had a few almonds and seems fine, keep monitoring him. If he’s not allergic, it should be absolutely fine. If, however, you know for a fact that your dog ate almonds, a whole big bag of them, immediate action needed. In that case, you will have to induce vomiting. That should be done within the first 30 minutes, counting from the time of consumption. Vomiting can be induced by hydrogen peroxide and must be instructed by the vet. Call the vet, tell him what happened, and he’ll (or she, obviously) will guide you how to proceed. You can also call poison control to help you with induced vomiting. You might be not totally certain when your dog ate almonds or can’t induce vomiting. In that case, you should monitor your dog for any signs of illness. If and when these occur, bring the pup to the vet immediately. Dogs and almonds are a bit like a forbidden romance. Dogs love almonds but should be really careful with them; only they don’t know it. It is the owner’s responsibility to keep them separate. Want to know which nuts are fine for dogs to eat? Then this is a must watch video for you. It is time for us to find out about the most queried topics about dogs and almonds. Let’s zoom into and finalize the particulars of feeding almonds to our furry friends, the dogs. 1. Can dogs have almonds? Are almonds ok for dogs? The short answer is yes. Almonds are among nuts which are ok for dogs to eat, together with peanuts and hazels. The thing to remember is that it is not very recommended. It might lead to choking or intestinal obstruction. When consumed in large amounts, they present a real danger where veterinarian interference is needed. Salted or sweetened almonds should be off limits. 2. Can dogs eat almond butter? Can dogs have almond milk? Dogs can definitely eat almond butter and milk. These two products are actually excellent for them to have. 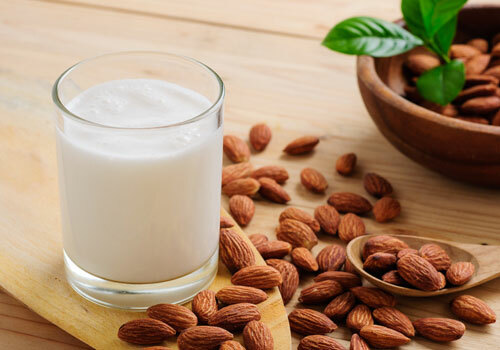 Butter and milk made from almonds contain all the vitamins and minerals almonds have. These are helpful for the dog’s overall health and his beautiful coat. Moreover, when processed, they lack the dangers of whole almonds. They are much easier and safer to consume. 3. Are dogs allergic to almonds? Some dogs may be allergic to almonds while others not at all. This is a factor that has to be checked. 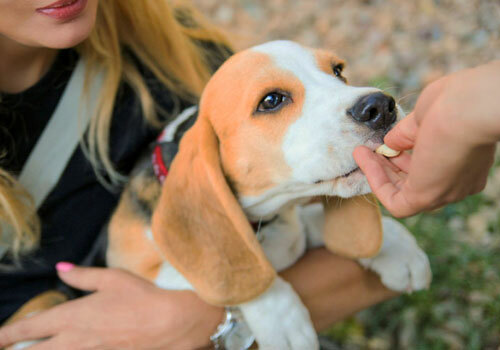 For that particular reason, it is a good idea to feed your dog only a small amount at first. After you see his reaction you know if to increase or cease altogether. In general, almonds are not easily digested by dogs. Almonds can, therefore, easily upset your pooch’s stomach, causing him gastric and intestinal distress. 4. Are almonds poisonous to dogs? Are almonds toxic to dogs? It is a no. Raw almonds for dogs aren’t toxic or poisonous. On the contrary, they may, in fact, deliver great benefits to dogs. Vitamin E, magnesium, copper and more, are all vital elements for a healthy diet. However, almonds consumed in too large amounts may present a real danger for dogs. 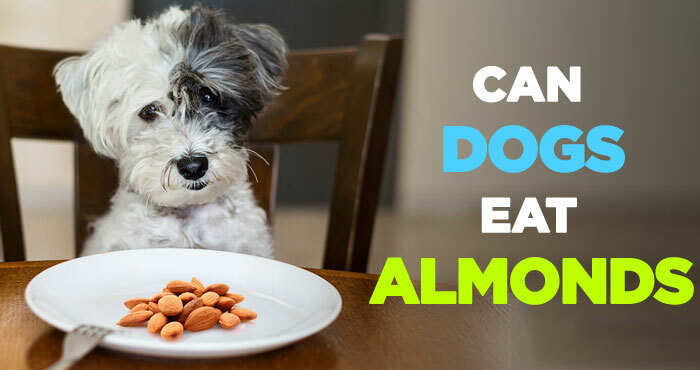 Although not toxic, yet still, almonds should be consumed carefully and in moderation since dogs don’t digest them well. 5. How many almonds can a dog eat without getting sick? There is no one answer to conclude this question. Amounts differ from dog to dog depending on their size and susceptibility. If it is a few almonds that your dog has eaten, he will be just fine. If your dog ate almonds, say a two-pound bag, there is a place for concern. Vomiting should be induced with vet’s instruction, and perhaps also a visit to the clinic is due. 6. Can dogs eat raw almonds? Are raw almonds good for dogs? Raw almonds are ok for dogs. They can certainly eat them. It is, nonetheless, recommended to limit their intake. Your dog may benefit more from an alternative of almonds butter or milk. If, however, it is raw almonds in particular that you wish to give him, that fine. Just bear in mind that he can’t digest them properly, so a small amount only should be given. 7. Can puppies eat almonds? Or almond butter? Puppies can eat almonds and all of their products. Just like mature dogs, puppies love the smell of roasted almonds. Important to remember that since they are smaller, a smaller amount should be given. Almond milk is a wonderful option. Start with little and see how he reacts. Let his stomach get used to it gradually. Eventually, when he’s used to it, one to two glasses will suffice. So, the answer to the question “Can dogs eat almonds” is positive. Yes, they can. Are almonds fine for dogs to eat? Yes, they are. Now that this is out of the way, specifics must be acknowledged. These are such as to force us to consider the size and stomach of our pooch. Dogs don’t actually digest almonds. Therefore, small amounts should be given. Almonds also present a choking and obstruction hazard. To bypass those dangers, you can give your beloved furry friend almond butter or milk. Make sure that you purchase those without added sweeteners, especially Xylitol. If you feed your dog raw or roasted almonds, avoid the salt. Salt may lead to dehydration and electrolytic imbalance. Follow the dog’s behavior after he had eaten the almonds to monitor if he’s getting sick or else. All in all, almonds are the kind of food dogs like. It’s ok to give it to them, but with cautious. Raw nuts aren’t highly recommended but still fine. Almonds butter and milk are a good alternative, which should be introduced gradually.